Despite CIOs' claims of embracing digital capabilities, digitization at most organizations remains a slow-moving process, McKinsey says. Business transformations that leverage digital technologies may sit atop most CIOs' priority lists, but the reality is that digitization is far from mainstream. Industries remain less than 40 percent digitized on average, according to research McKinsey & Co. released earlier this month. McKinsey defines digitization as technologies that virtualize and automate products, services and supply chains. They may include new digital business models and marketplaces, such as online and mobile distribution. Reporting methods for digitization typically include predictive analytics, which providers can use to improve service by anticipating customer needs. Teasing apart the digital leaders from the fast followers and laggards is not easy, as many companies remain in various stages of their digital journeys, which range from digitizing only customer touchpoints to digitizing entire business processes and creating new digital revenue streams. But McKinsey may have stumbled upon a blueprint for success. The consultancy says that 49 percent of leading companies are investing in digital more than their counterparts do, compared with only 5 percent of the digital laggards. "Heavy digital investment is a differentiator," said McKinsey researchers Jacques Bughin, Laura LaBerge and Anette Mellbye in their report. Another differentiator is alignment between IT and the business. McKinsey found that leading companies are more than twice as likely to align their digital and corporate strategies than other companies. "Bold, tightly integrated digital strategies will be the biggest differentiator between companies that win and companies that don’t, and the biggest payouts will go to those that initiate digital disruptions," say the McKinsey researchers. Most CIOs joke that their transformations are never truly complete as they embrace emerging technologies, including internet of things, artificial intelligence and blockchain, but some sectors are further along than others. Media and entertainment (62 percent), along with retail (55 percent) and high-tech (54 percent) tend to be ahead in their digitization efforts compared to sectors such as consumer packaged goods (31 percent), automotive (32 percent) and financial services (39 percent). Industries hovering in the digital media include healthcare (51 percent), telecom (44 percent) and professional services (42 percent). 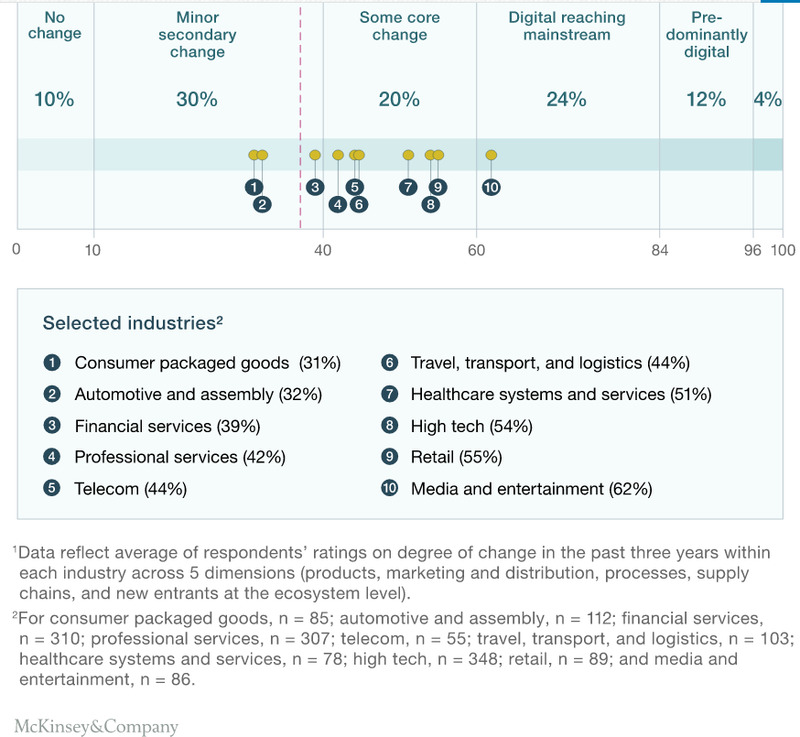 McKinsey also found that digitization levels vary by business operations. For example, 49 percent of survey respondents say customer-focused areas such as marketing and distribution are primary focuses of their digital strategies. Digital marketing takes many forms, including anything from email campaigns and social media outreach to loyalty programs and customized offers. “That focus is sensible, given the extraordinary impact digitization has already had on customer interactions and the power of digital tools to target marketing investments precisely,” McKinsey says. Supply chain sits at the opposite end of the spectrum, with only 2 percent of respondents saying that their supply chains are the focus of their digital strategies. The McKinsey researchers question whether overlooking the supply chain may lead to some course correction and resource reallocation. Digitization remains a double-edged sword. As much as digital can help companies more quickly and directly engage with consumers via online, mobile and social channels, the reduction in friction opens products and services companies up to competition from startups. This scenario is playing out in the transportation sector, where Uber and Lyft have disrupted the taxi industry, and in media, where Facebook and other online destinations are capturing dollars typically spent on traditional advertising. "Current levels of digitization have already taken out, on average, up to six points of annual revenue and 4.5 points of growth in earnings before interest and taxes," McKinsey says. "And there’s more pressure ahead as digital penetration deepens." Digital winners avoid such losses, course-correcting their corporate strategies significantly to meet digital disruption head-on, while keeping a laser focus on their customers. That requires great strengths in organizational culture and the ability to steer clear of siloed mind-sets and behavior. “A strong organizational culture… enhances the ability to perceive digital threats and opportunities, bolsters the scope of actions companies can take in response to digitization, and supports the coordinated execution of those actions across functions, departments and business units,” say the McKinsey researchers.